That American forces should torture prisoners in their "war” on terror is disturbing, but more shocking still is that the highest officials of the Bush-Cheney administration planned, authorized, encouraged, and concealed these war crimes. Unfortunately, due to sales rights restrictions, we cannot offer Getting Away With Torture for sale in your country. That American forces should torture prisoners in their "war” on terror is disturbing, but more shocking still is that the highest officials of the Bush-Cheney administration planned, authorized, encouraged, and concealed these war crimes. When the Supreme Court ruled that the officials were bound by the Geneva Conventions, a Republican Congress responded by granting amnesty to all responsible, from lowly interrogators to the president, while conservative judges erected a wall of secrecy to protect them even from civil liability. Meanwhile, timid Democrats have shown little stomach for repealing the amnesty law and bringing those responsible to justice. 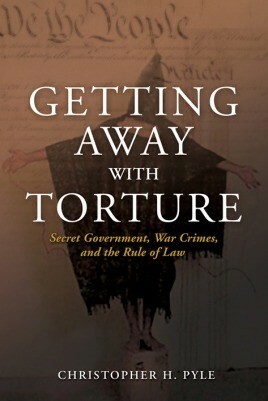 Many Americans, including those who endorsed torture to find"ticking bombs” that never were, are now embarrassed by credible reports of CIA kidnappings for purposes of torture, secret prisons into which prisoners have disappeared without a trace, and rigged tribunals to convict al Qaeda's criminals on evidence obtained by torture. But the problem is not just embarrassment; it is the widespread acceptance of unaccountable, secret government that now threatens to destroy the very foundations of constitutional government. The moral standing of the United States will not be restored, Christopher Pyle argues, until a concerted effort is made to bring our secret government under the rule of law.